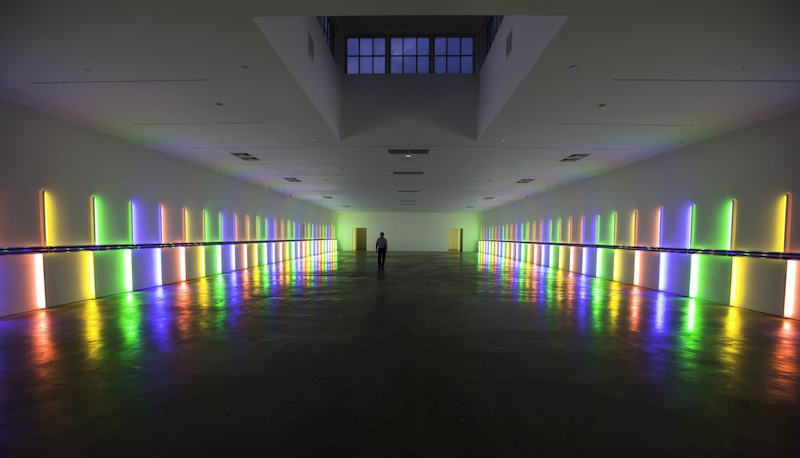 Pop in to see the minimalist fluorescent light-based Dan Flavin Installation, including its grand and rainbow-reflective main space, at The Menil Collection‘s Richmond Hall. 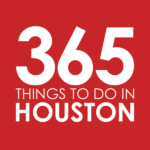 Set a couple of blocks south of the main Menil campus, in a former grocery building on Richmond, you’ll find the final works of minimalist artist Dan Flavin. 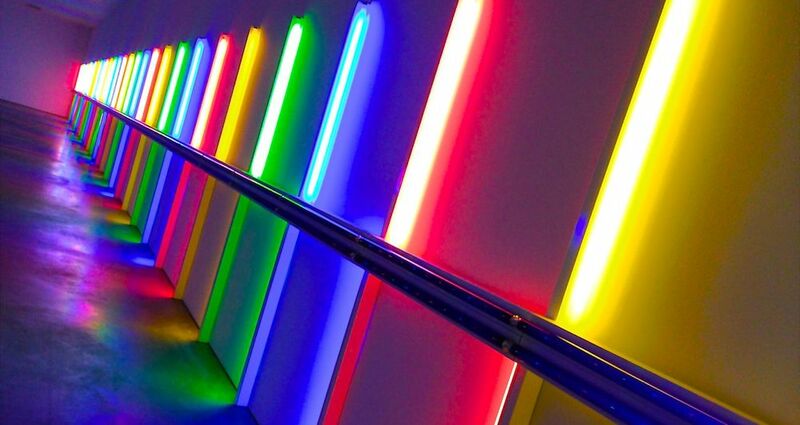 One of the founders of the minimalism movement in the 1960s, Flavin earned notoriety by using light as his medium. His works involved not just the light sources he assembled, but also their interactions with the spaces were they were displayed. Flavin’s creations at the Menil showcase the interplay between vivid neon lights and their surroundings. The largest and most visually striking of his works (shown here and above) fills most of Richmond Hall’s interior space. Yellow, green, blue and pink fluorescent tubes are lined vertically along both sides of the hall in a steady pattern. The top and bottom are divided by long, horizontal black lights intersecting their stretch. The intricate placement of the repeating pattern multiplies the effect of mirrored light. The entire hall makes for a calm, peaceful and slightly other-worldly spot to stand and to reflect on yourself in turn. Flavin’s other works on site include the long green fluorescent lighting lining the exterior roofline of Richmond Hall’s east and west sides, the building’s lobby with its two sets of diagonally-mounted white lamps on its original walls, and a exhibition of four of his earlier works. The original three works showcased in the installation were commissioned in 1990 by Dominique de Menil herself. Flavin designed each of the three especially for the space at Richmond Hall, which was originally built in 1930 as Weingarten’s grocery store. The Menil Foundation bought the building in 1985 preventing its risk of demolition. Flavin completed his design for the building only two days before he passed away in late 1996, and his studio staff completed the creation and installation of his plans. In 2003, the storage space in the back of the building was converted to a small exhibition room and four piece of Flavin’s monuments series. This series “monuments” to V. Tatlin (1964–1969) are representative of almost 50 similar pieces that Flavin created as a tribute to Vladimir Tatlin (1885–1953), one of the leaders of the avant-garde Russian Constructivism movement that took hold in Moscow and St. Petersburg in the first half of the 20th Century. You can certainly make Richmond Hall a stop on your visit to the Menil Collection. But its convenient access and parking just off of Richmond Avenue mean that it’s even easier to stop in on a whim. If your day is feeling particularly frenetic, just pull up to the parking spots behind the building, duck inside, sign your name with the greeter, and take in Flavin’s work. If you’re in a rush, it will take you five minutes. But we encourage you to take enough time to just soak in the main hall and contemplate the light patterns and reflect on your own daily life and what unexpected reflections you might be creating yourself.